So far I think I have made about 100 various ornies for my Project Nepal fundraising (see my web page for more details of that). 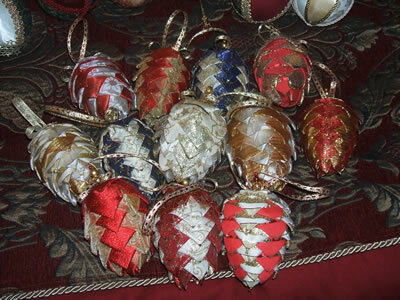 Most of them have been the pine cones and baubles below rather than the stitched ones as I have had lots of positive feedback from these. A big thank you to all who have supported me in my efforts. The original idea comes from a very talented woman called Sue Schofield who I came across last year at one of the stitching shows that I attended. 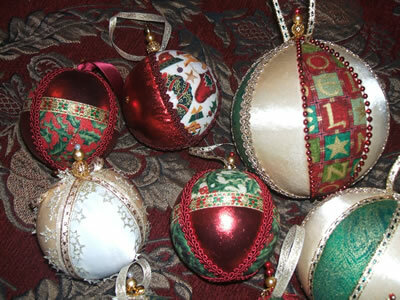 If you want to find out how to do them she has published a book called Decorations to Dazzle and also sells kits from her web site. I am carrying on with my stitched ones though as much as I love making the others I am suffering stitching withdrawal so am starting a new batch now for next year’s Xmas fundraiser. 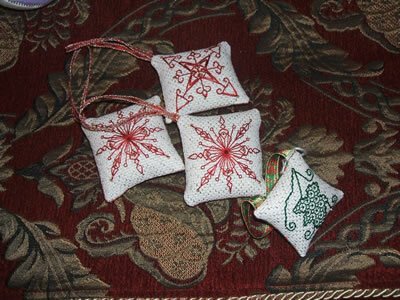 Below are some I made a while ago – the two identical red ones come from a lovely set of free patterns from Tree Trunk Designs which I found during one of my many wanderings on the web. The blackwork leaf is a small part of a larger pattern from one of my stitch magazines – I tend to use little bits out of lots of patterns for ornies and have just ordered some more Quaker patterns online which have wonderful motifs for next year’s ornies. Other patterns I have found from the great Gift of Stitching online magazine which is great value compared to buying paper mags – not that it stops me as I like to have something to read in the bath or on the bus! Have just downloaded the latest copy and it is full of ornies – have not had proper look yet but will print some pages off later when everyone is in bed – how exciting! I did stop buying mags for a while as I felt guilty about not stitching things from them and thought that I had enough patterns but then I thought Jacob subscribes to Nintendo and doesn’t do anything with that so have been buying them again now and have treated myself to some new subscriptions as well on the grounds that it is cheaper that way. I don’t tend to buy kits unless it is something really special so most of my stitching comes from my mags. My daughter Ellen has applied to go to Kosovo in the summer with her college to run a summer school project for war orphans and if she gets accepted will need to do some fundraising for that. If not I am sure I can find some good cause to donate my proceeds to and the school in Nepal needs continuing help to fund supplies and salaries. Must go now to finish off the latest order . Wow, Alison. I hadn’t realise that you’d made these when I saw them at work today – they’re beautiful! I love your xmas ornaments Ali, they’re fab.